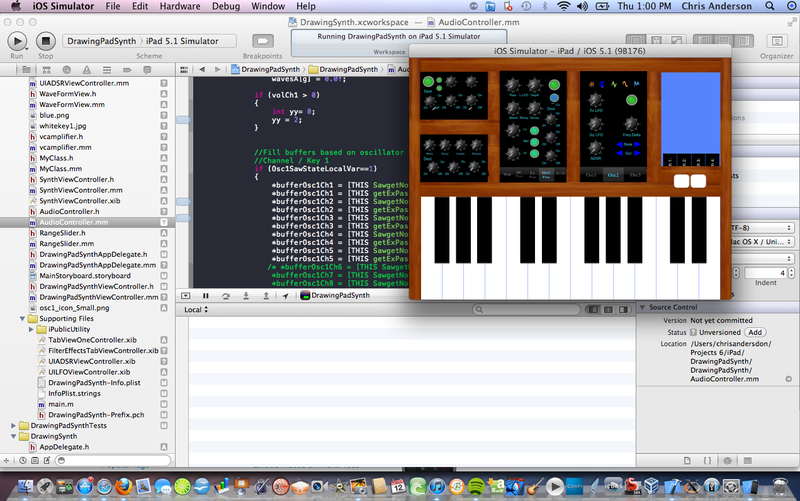 On and off over the past couple of months, I have still been adding different features to the iPad synth. Most of what I have been doing is to try and get the interface to look right, with turn-able knobs and with some on/off indicators and the like. 11-13 weeks of work…..I think. Here is a screenshot of what this thing looks like at the moment: The last bay (empty) will be a recording control interface, with the eventual output graph for the recording displaying as a pop-up. The drawing waveform interface will show up on top of everything as a pop-up. « Worked through iOS’s effects AudioUnit implementation!